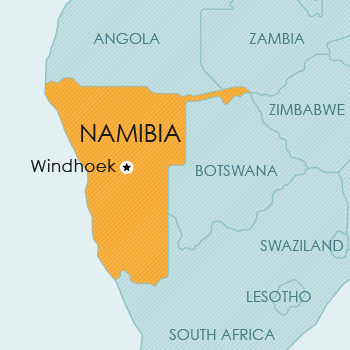 The independent Republic of Namibia, which gained independence from South Africa in 1990, is situated on the south west coast of Africa, bordered by the Atlantic Ocean to the west; South Africa to the south and south east; Botswana to the east and Angola to the north. The Caprivi Strip extends Namibia to the Zambezi River, forming a border with Zambia. Languages: English (official language), Afrikaans, German, Khoekhoe (Nama), Herero, Ovambo. Namibia is a member of the Paris Convention, the Madrid Agreement and Protocol, the ARIPO (Banjul Protocol), and the WTO/TRIPS. Namibia is soon to have a new Industrial Property Act, which will provide for the Paris Convention, ARIPO (Banjul Protocol) and the Madrid Agreement and Protocol. However, this Act has not yet been enacted or implemented. Trade mark applications are still processed under the existing legislation. Provision is made for the registration of trade marks for goods and for services, for certification marks, and for defensive trade marks. The Act provides for a Part A and a Part B of the register. In order to be registrable in Part A of the register, the mark must be or contain a distinctive mark, while for registration in Part B the mark must be capable of becoming distinctive through use. Namibia is a member of the Paris Convention, ARIPO (Harare Protocol), the PCT and the WTO/TRIPS. applications designating Namibia, nor for PCT national phase applications. In the meanwhile, Namibia has acceded to the Paris Convention, to ARIPO and the Harare Protocol, and to PCT. Namibia is expected soon to have a new Act, which is currently before the Namibian parliament and which will provide for the Paris Convention, ARIPO and PCT. However, this legislation has not yet been implemented. Accordingly, patent applications are still being processed under the old legislation. Despite this, the Namibian Patent Office is accepting the filing of convention and PCT national phase applications. However, the validity of any patents granted on this basis is uncertain in the light of the absence of local enabling legislation. Nevertheless, the Namibian Constitution does contain a provision which indicates that any international treaties which are signed by Namibia will have legal effect, whether supported by local legislation or not. Namibia is a member of the Paris Convention, ARIPO (Harare Protocol), the Hague Agreement, and the WTO/TRIPS. In terms of the 1923 Proclamation, design protection is obtainable via a national filing in Namibia. Namibia is expected soon to have a new Act, which will provide for the Paris Convention, the Hague Agreement and ARIPO. However, this Act has not yet been promulgated, and applications are therefore still being processed under the old legislation. Namibia is a member of the Berne Convention and the WTO/TRIPS. tables and compilations of data. Currently, no legislative provision for plant breeders’ rights or other sui generis protection for plants is available in Namibia.